This topic contains 0 replies, has 1 voice, and was last updated by ChomperHugger 1 year, 5 months ago. Young Cera walked with her father in the Mysterious Beyond. “So Threehorns are the best.” Cera replied to her father. They had been talking about why Threehorns were better than Longnecks, Swimmers, Flyers, and Spiketails. “Yes, especially the Flatheads. They have tiny brains.” Topps replied. “Topps dear. What are you telling Cera?” called Topps’s wife, Cerata. They had named Cera after her. “The truth.” Topps replied. Cerata sighed. “Oh not that claptrap about Theehorns being better than everyone else again!” Cerata groaned. “There is nothing wrong with being proud of being a Threehorn!” Topps snapped. “I never said there was. I do find it wrong that you think Theehorns are better than every other type of dinosaur.” Cerata replied. “I have yet to find evidence to the contrary Cerata.” Topps said. “You are as stubborn as ever.” Cerata sighed, walking away. Cera decided to playfully ram her father. He didn’t mind, for she couldn’t really hurt him at her young age. Cera soon got distrusted by a Stink Bug. Topps knew that it was not a good idea to mess with them. He had told Cera that too. However, she had inherited his stubbornness and so still continued to focus on it. Topps sighed. She’d have to learn the hard way. Cera began to run in place, preparing to attack the Stink Bug. Then she charged after it, letting out a Threehorn screech. She smashed down a fair-sized boulder as she chased after it. She kept going and soon crashed into another boulder, breaking it. This time the force of the impact knocked her down. She continued to chase after it, smashing more boulders in the process. Eventually, she got near the Stink Bug. She grinned. However, then the creature squirted her in the face, spraying her with purple goo! She heard someone laughing at her. She looked and spotted a Longneck boy, laughing at her. She had seen Longnecks before but never spoken to one. Her dad never had anything nice to say about Longnecks. “What are you laughing at?” she snapped at him. He gasped. She began to run in place, preparing to charge at him. He began to do the same. They charged at each other. Cerata and Topps noticed the two. Topps ran toward the Longneck. He blocked his way. He glared angrily at the Longneck, who slowly backed away in alarm. 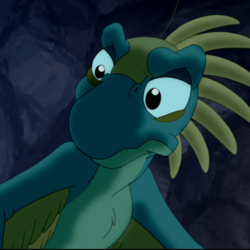 Cera heard someone call “Littlefoot!” Was that the Longneck’s name? Interesting name for a Longneck. Cera wanted to please her father. She stuck out her tongue at Littlefoot. She heard someone, presumably Littlefoot’s mother, call “Littlefoot!” again. 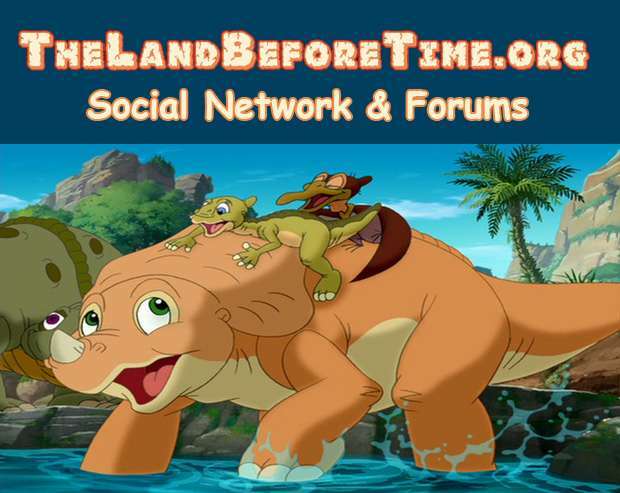 As the Longneck’s mother came near, she snapped at Littlefoot “Threehorns never play with Longnecks!” Her father moved her away from Littlefoot and Littlefoot’s mother likewise moved him away from her. The Longnecks went away. “I don’t get why Threehorns cannot play with Longnecks.” she said. “Because Longnecks are not Threehorns. We’re best keeping to our own kind.” replied her father. The two of them climbed a steep rocky hill. He didn’t seem that bad. At the top, the two came to Cera’s mother. She was similarly colored to Topps, but was a bit lighter than him. “Topps, where has she been?” she asked him. “Cerata, our daughter has been playing with Flatheads.” Topps replied. “Oh Topps, I don’t see the big deal.” Cerata said. “Our daughter will not be playing with Longnecks. It’s not right. It’ll make us look bad.” Topps countered. “I don’t see the harm.” Cerata argued. “My old man wouldn’t have approved of it.” Topps replied. “You don’t have to live your life like he does his.” Cerata snapped. Cera was bothered. She hated it when her parents argued. They didn’t do it too often, thankfully, but when they did, it could get nasty. “My father made me what I am today.” Topps said. “I can see that. But you’re not Tribus.” his wife argued. The two continued to argue. Cera didn’t like the arguing and so ran away to a place that was quiet. It was a mud pit of sorts. 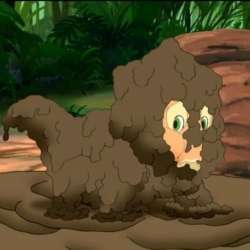 It had bubbly mud that bubbled up and sometimes had the bubbles explode and leave muddy goo on her face. Also, hoppers ran around nearby and croaked, sometimes eating bugs that got too close. Cera tried to chase these. However, she had a hard time catching them. As night fell, Topps and Cerata realized that Cera was gone. “Where’s Cera?” Mr. Threehorn asked Mrs. Threehorn. “Probably went to go somewhere to go wait for us to stop arguing. You know she hates it when we argue.” Cerata replied. They went off looking for her, without success. Cera, meanwhile, continued to play in the mud pit. That it was well past midnight didn’t occur to her. Finally, she heard somebody nearby. 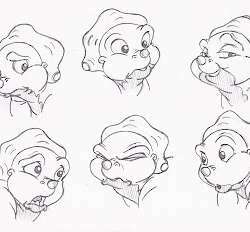 However, it wasn’t her mother or father, but the Longneck, Littlefoot. What we he doing here? And didn’t he get that Threehorns didn’t play with Longnecks? “You again? Go away! That’s my hopper!” she snapped at him. She turned to go back after the hopper. “I saw it first.” the Longneck retorted. “Well, he’s in my pond!” Cera replied. She ran after the hopper, making a splash in the muddy pond as she lunged at it. She missed it. Cera was suddenly knocked over as Littlefoot lunged at the hopper. She glared angrily at him. “Rrrrk! Rrrrrk!” the hopper cried again. The two of them both tried to capture it. They were enjoying themselves. 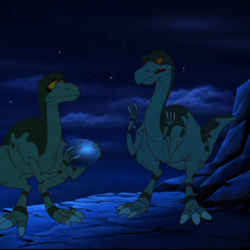 “Over here!” Littlefoot called to her. They lunged at the hopper again. “Hey, this is fun!” Cera said. The two of them were chasing the hopper, laughing. Cera was glad that her father couldn’t see her now. He certainly wouldn’t approve. They suddenly heard something coming. Cera wondered if it was her father. If it was, he was certainly angry and in a hurry from the sound of it. Was she going to get into trouble for playing with a Longneck? She soon realized, however, that it wasn’t her father, but something worse, a Sharptooth! The huge Two Claw came into sight, charging at the both of them! 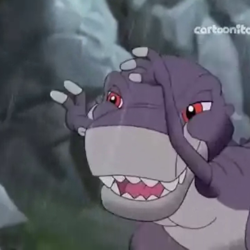 “Sharptooth!” she cried. The two of them ran for it. “Help!” she cried. The two of them fled into a big patch of thorns. The Sharptooth moved into the thorns, sniffing for them! They hid underneath a thorn. The Sharptooth had trouble finding them but was still very close. “Go.” the Longneck whispered to her. They wandered away from the Sharptooth. “This way.” the Longneck said. “Mmm, mmmnh!” Cera argued, running off. Cera kept running. She could hear the Longneck yelling. Had the Sharptooth gotten him? She soon reached the end of the thorn patch and ran across the Longneck. The Sharptooth was right behind him. It looked bad for both of them. WHACK! The Longneck’s mother attacked the Sharptooth. “Run! Run!” she yelled at the two. They ran to safety. The Longneck and the Two Claw engaged in an intense fight. Eventually, however, the Sharptooth got the upper hand, tearing the flesh of the back of the Longneck. The Longneck, however, was able to push him off. She ran toward the kids. The Sharptooth was behind them. What would they do now? Cera desperately wanted to get to her parents. After hearing how bad Longnecks were from her father, she had seen one risk her life to save her. How was that possible? Just then, the ground shook! The earth began to split open. The earth continued to split as time went by. It was a massive earthquake. The Sharptooth was right behind them. He suddenly lost his balance as the ground shook very hard. He tumbled toward a huge fissure. 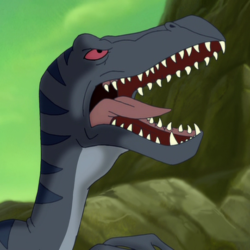 He would have taken the kids with him, dragging them with his feet, had not the Longneck mother struck the Sharptooth once more with her tail and also grabbed her and Littlefoot. She brought them to safety. The Longneck and his injured mother ran off. Cera spotted her father and mother in the distance. She ran toward them. “Daddy!” she yelled. Ahead of her, the ground split in front of her, blocking the path to her parents. The divide kept growing. Loads of dinosaurs were killed in the chaos. When the earth had stopped shaking, Cera was on one side of the divide and her parents were on the other. “Cera!” he father called to her. “Cera, are you all right?” Cerata asked. “Yes. The Longneck saved me!” Cera replied. Topps had seen it too. The roaring of the Sharptooth had attracted his attention. He had wanted to fight him but was too far away. The Sharptooth would have eaten his daughter if not for the Longneck. Cera continued to stay put, too shocked and afraid to move. “Cera, I need you to find a way across.” Cerata called to her. “But I don’t want to leave you.” Cera replied. “Just follow the divide and we’ll meet up, hopefully on the other side.” Cerata said. After waiting for two hours, Cera finally agreed. Before she moved out of sight, Cera took one more look at her parents, then moved on, following the divide. That was the last time she ever saw her mother.